Thank you for visiting my genealogy site for the book, Trek to Texas: 1770 – 1870. Yes, this is an actual book, though the number of copies are scarce, which is one thing that prompted the idea for putting it onto the Internet. To the best of my knowledge, one copy went to each “branch” of the family, my Grandmother’s copy being handed down to me. It was originally written by my grandmother’s cousin, Pearl Foster, and copyrighted in 1966. One copy resides in the Texas History section of the Northeast Campus of Tarrant County College. A portion of the book has also been quoted by the Grapevine Historical Society’s Newsletter. The original book was researched by visiting libraries, archives, and city and county records, pouring over dusty books, interviewing family members and compiling records, photos and stories, then lovingly hand-typed on a manual typewriter. All in the days before the Internet, this was an amazing feat! In the spirit of Pearl’s hard work, I’ll be re-typing each of the 200 pages – mostly because of the time it would take to proofread an OCR scanned version of the typewriter text would be harder than just re-typing everything. I apologize in advance that the project may take longer this way. To read the book in its entirety, you can start at the Title Page and Introduction by clicking the Book category in the navigation menu. Each new page added will be in traditional linear format. I want to thank everyone who has contacted me and offered additional information/offers to help. It’s so great to hear that so many copies of the book still remain with members of the family! I want to assure you that I have not dropped this project, however due to an injury with my shoulder and other commitments it was placed on hold for much longer than I anticipated. I will be updating the site again soon to finish the book text. Phase 2 of the project will include scanning the original pages of the book, as well as scanning and adding as many of the original photos from the book as possible – I have 3 large boxes worth of photos of the Foster and Wright families to sort through and scan, as well as all of Mrs. O’Donnell’s original research and other (as yet) unpublished works. Besides the story that is told! When first we read those chapters through. For every carefree girl and lad. Besides the story which is told! Dear memories have prompted the writing of this chronicle about the neighbors, families and the ancestors of my father Ambrose Foster. He left us for a better world Thanksgiving 1949 and his last wish was to hold his first great grandchild in his arms. His first great grandson was born July 15, 1950. May my critics judge the contents only and not on my ability as a typist, and remember my lack of training as a writer. A few words omitted and other minor errors have not been changed because of the tremendous job of typing a full page without error. I’m 60 years old now as of November 3rd. I bought my book at Mrs Pearl Foster O’Donnell’s home for 10 dollars. My mother ( Ola Lois Bennett Gentry)and Grandmother (Ola Mae King Bennett)were with me. It was greatmeeting her in her home. I’s great seeing this website. Thank you, Floyd! What a great story. My mom met her when she came to a family reunion while researching Trek to Texas. I never had the opportunity to meet her in person but she was a very lovely lady. Also wanted to say that your artwork is beautiful. Thank you for posting a link. I accidentally came across your website while looking for another Steve Hallford in Washington State. 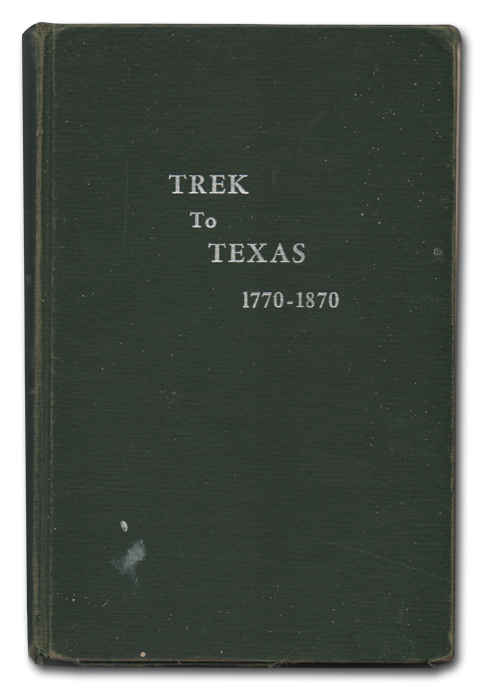 I have been looking for Trek to Texas for years. I know you would never part with your copy but have you considered scanning your copy into your computer and making a digital copy available for others. My family is mentioned in the book many times. My great-grandfather Andrew Jackson Hallford was married to Dizanna Foster. They were all involved in the founding of Lonesome Dove Baptist Church. If you are interested, I have written a story very loosely based on the Trek To Texas about the trip from the point of view of A. J. Hallford. Hope you are well. Hi! My great,great, great,great grandmother is Lucinda Foster (Dizanna’s mother.) I have been researching the family for a few weeks and would love to read your story if you will share! I look forward to the completed Trek to Texas. I am a descendant of Thomas Jefferson Casner, who was on the trail west from Texas in 1868, the same year the Medlins were westering to California. T.J. Casner recollections about his trip from Blanco County to southern California is posted on the internet. I’ve used the published account of the Medlin’s 1868 trip, as well as those of other wagon trains from Gold Rush days to the early 1870s, to reconstruct what life was like on a westering wagon train in 1868–sort of filling in the gaps of T.J. Casner’s brief account. After your shoulder heals, keep me posted when Trek to Texas will be completely online. I look forward to reading it. I came across your site looking for more info on my MCBRIDE/O’DONALD(O’DONNELL) line’s trek from KY to TX. I must say I was pleasantly surprised to find that your surname is O’DONNELL! My line came to Azle, Tarrant Co., somewhere between 1870 (last found on census) and 1893 (Henry Boyd MCBRIDE marries Sarah Elizabeth O’DONALD(O’DONNELL). I was hoping to be able to find this book somewhere. I’ll keep looking! But thank you for brightening my day!